It’s been a while since we turned our backs to the traditional three meals a day and decided to replace hem with 5-6 smaller meals equally spread throughout the day, snacks aside. We’ve been led to believe that this will keep our metabolism at high speed at all times and prevent overeating. But is this really the superior way to eat? Scientific research wouldn’t agree – there’s a lack of studies that could confirm this myth that has already gained the status of an “unquestionable truth“. In fact, there are many studies who suggest quite the opposite, or that eating more frequently can actually put you at risk of packing more fat. And by eating 6 times a day, you can easily overdo it with the number of calories. We’re not saying that you should stop doing this – it may do wonders for your energy levels, feeling of satiety and shedding body fat, especially if you’re an athlete and you do it carefully. Just stop treating it as a fact of life and advocating it as the only road to significant weight loss. Like we’ve said previously, a certain strategy will work differently for different people. We all have different bodies, nutritional needs, job demands and exercise habits. And some people can harness far greater results by consuming only three meals a day – others lose a ton of fat and improve their health by practising intermittent fasting every day. So, to each his own. And what is the norm for moderate consumption of potato chips, for example? One bag a day or one bag per week? Of course that the food industry wants you think their junk products are not all that bad, as long as you don’t nibble on them all day long. Hey, isn’t even water bad for your health if you drink too much of it? This kind of rationalization is terribly harmful. If the process of burning fat was that easy, allowing you to eat whatever your brain craves, you wouldn’t be reading this article right now. Your diet won’t be the same if you allow yourself deep fried foods and sugar-packed desserts every day, somewhere in between all the steamed broccoli and lean meats. Moderation isn’t the key, self-discipline is. If you find yourself so content with the amount of healthy food you consume that you give yourself the permission to cheat with junk food “in moderate quantities“, you’re more likely to gain fat instead of shedding it. If you choose to eat everything in moderation, don’t expect great results. 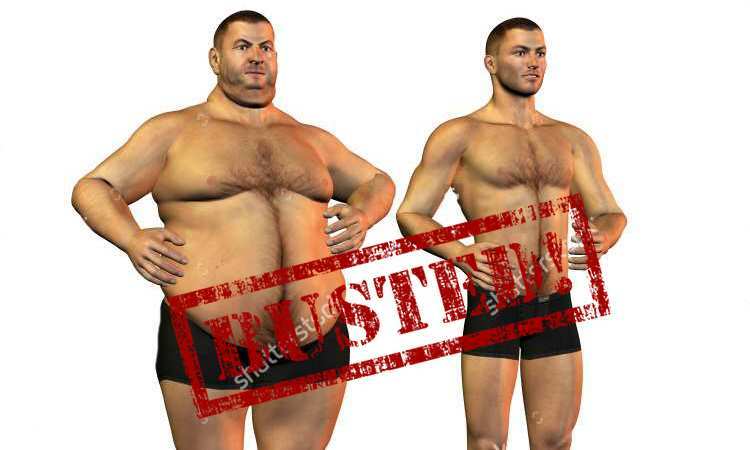 If you’re serious about trimming your excess body fat, you will need a diet plan consisting of healthy nutritional choices and extremely rare cheat meals. Sorry folks, but as we’ve stated before, not all calories were created equal. Try to avoid succumbing to these attractive myths the next time you’ll be planning your ideal diet to significantly increase your chances of fat loss. And don’t skip the gym – working out regularly is the most efficient (if not the only possible) way to turn your body into a fat-burning machine.